With a proven track record of twenty years, we have been empowering enterprises globally in building flexible, cost-effective breakthrough solutions and services. In this highly competitive, evolving world our pioneering IT Services, consulting and outsourcing solutions, facilitate enterprises aspire in IT Infrastructure Management, Vendor Management, IT Consulting and advanced technologies like- big data, and cloud computing. Core IT designs, for its customers, innovative, customized solutions following crucial Global Benchmarks and Standards, helping them utilize time in the market and enhance ROI from their IT implementations. We acknowledge nurturing relationships and surpass our responsibilities to steer growth for our clients. We at Core IT deliver world class IT infrastructure services by aligning technology to business needs. Our team provides the competitive edge by optimizing technology, delivering high grades of trust, agility, flexibility and skills in each engagement. Our endeavor is to form everlasting relationships with our clients, prioritizing trust over transactions, creating business values, reducing implementation risk and accelerates speed-to-market. 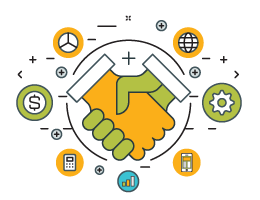 We work to bring transparency and build trust in our relationships by working closely with client teams to meet business goals. Our team has the experience to provide the 'right-fit' solution and expertise to implement and manage the IT services across industry verticals. We take ownership of service issues and are committed to agreed service KPIs. Our team will ensure that the issue is resolved in minimum time.